One Friday night straight from school , me and my class went to Birkheads Wild for an overnight stay. Our class teachers came with us too . When we got there we did not expect the huge field it was really not what we expected .We had no idea that there would be a pond and campfire and the composting toilet and the tents it was totally AMAZING . I was really worried about all the different types of bug and creepy crawlies. Also the dark and the trees in the dark look like big giant people. Whilst I was there I ate marsh mallows and sat next to the fire, and I set some cotton wool on fire I made a bracelet I went to see the pond I went on the swing I built a den with my friends. 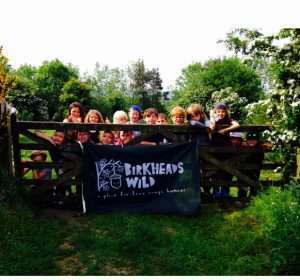 Everyone should go to Birkheads wild because its in nature and its fun to be outside and its just awesome so everyone go to Birkheads wild!! The site was cool it was very big, it was awesome it looks cool and amazing. I was nervice about my first night at birkheads wild but now that I’ve been there now I am not nervece so I can go there any time. I will remember that it is cool and awesome and amazing and when I camped there with my class it was very very cool. I would say don’t forget your food and don’t be worried because it will be fine.